Quesadilla makers solve this problem. In order to use these snazzy devices, you simply load in a couple of tortillas, slap on a bit of cheese, and then close the device and wait. A few minutes later, you’re rewarded with a perfectly toasted quesadilla that slides right out! Best of all, modern quesadilla makers are totally nonstick, meaning that you can clean up any excess cheese with a paper towel in seconds. In order to help you choose the right device for your kitchen, we’ve picked out some of the best quesadilla makers on the market. Here are the four best quesadilla makers as of 2018. When you have 6 or 8-inch tortillas, the Hamilton Beach 25409 Quesadilla Maker is the fastest way to get a perfect quesadilla. It quickly preheats to just the right temperature to brown the outside of your tortillas without burning anything. After a couple minutes of work, you’ll be able to remove a crispy quesadilla, complete with gooey cheese and pre-scored wedges. The Hamilton Beach 25409 features special top and bottom plates that are made just for making quesadillas. They’ve got ridges around the outside (to seal the edges) and raised lines that score your tortillas as they bake. This makes it very easy to tear your finished quesadilla into 6 perfect wedges. These design choices make this an excellent tool for making quesadillas, but you’ll have trouble cooking other things inside this machine. While the Hamilton Beach 25409 is nearly 10″ across, you’ll definitely want to stick to 6 or 8-inch tortillas for your quesadillas. There simply isn’t enough room for anything bigger. If you like your quesadillas stuffed full of cheese and other goodies, try sticking to larger 8″ tortillas. More stuffing can sometimes overwhelm and ooze out of smaller 6″ shells. Of course, some amount of oozing is nearly inevitable. Hamilton Beach has produced this tool with a modern non-stick coating. This makes it very easy to wipe up cheesy spills with a paper towel or sponge. One small downside to this unit (and all of the other quesadilla makers here, unfortunately) is that you can’t remove the cooking plates or submerge this tool in the sink. Still, cleanup is easy enough. There’s no power button on the Hamilton Beach 25409. Instead, it simply stays on while it’s plugged in. This makes cooking incredibly easy: all you do is plug in the machine, wait for it to preheat, load it up, and set a timer. When it goes off, you simply remove your quesadilla! Overall, the simple design and intuitive features of the Hamilton Beach 25409 make it a top pick for anyone wanting to make small quesadillas. If you want bigger ones, however, you’ll want to keep reading for options that can use 10″ and even 12″ tortillas. While it’s marketed as a pizza maker, the Betty Crocker BC-2958CR is one of the best tools available for making large quesadillas. It’s got a generous 12″ round baking plate and plenty of power for melting overstuffed monstrosities. 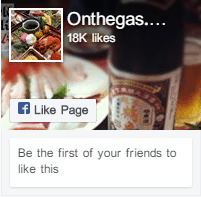 You can also easily cook other recipes, including eggs, pizzas, and various baked goods. When you’re done cooking, the non-stick interior surface makes cleanup incredibly easy. This tool is essentially a mini-oven that heats itself up to 400 F or so. This isn’t very different from the other quesadillas makers on this list (they all work similarly), but it’s especially notable here because of the size and shape of the cooking area. While the other picks have smaller circles that are bisected by ridges that score your quesadillas, this Betty Crocker tool has a large, deep circular cooking area. This lets you fill it with anything you want. Betty Crocker suggests pizza, nachos, quiche, party mix, and a few other recipes. In general, if it cooks in an oven at about 400 F, you can use this machine to cook it. But what about quesadillas? The BC-2958CR performs astoundingly well when it comes to quesadillas of any size up to 12″. You won’t get a tight seal around the edges, of course, and your quesadillas won’t be cut automatically. You may want to flip them over when they’re mostly cooked, too, to brown the top a little bit more. When they’re done, however, they’ll taste great. 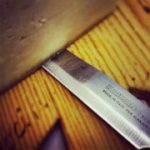 Best of all, the non-stick cooking surface on the BC-2958CR works especially well with spilled cheese. Any mishaps are easily cleaned up with a damp cloth. Overall, the Betty Crocker BC-2958CR is a great choice for both people who want to make big quesadillas and people who are after a more multi-purpose tool that doubles as a quesadilla maker. It’s got more than enough flexibility to see near-daily use in many households. You’ll make quesadillas, pizzas, and more. It’s definitely one of the best 12-inch quesadilla makers on the market. This medium-sized quesadilla maker is perfect for people who want to make quesadillas big enough to share. It’s quite similar to the Hamilton Beach model above, with non-stick cooking surfaces and a latching lid. With no timer or built-in shut-off, you’ll need to use a timer to get perfect quesadillas every time. Like the other two dedicated quesadilla makers we suggest, this unit has specially shaped heating plates that section your quesadilla into 6 even wedges. It won’t quite cut all the way through, but it will make it easy to tear your quesadilla apart by hand or use a pizza cutter to finish the job. Concentric rings around the edges help seal the edges and keep your fillings inside your tortilla. One difference between this quesadilla maker and the other options is how deep the pockets in each wedge are. 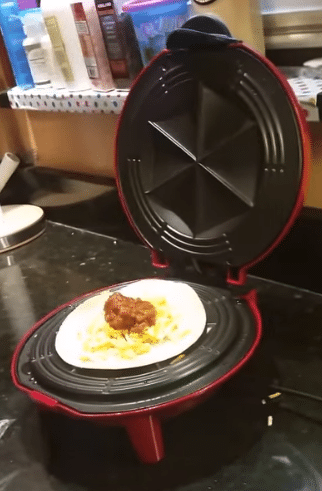 Unlike the other choices, this quesadilla maker has plenty of room for extra cheese, veggies, and meat. If you like your quesadillas stacked high, this quesadilla maker is a great choice. The only other machine that rivals it is the Betty Crocker above. The non-stick coating on this quesadilla maker is quite similar to the other options. It’s very easy to use a damp cloth to wipe off any cheesy residue that your quesadilla leaves behind. One thing to note: non-stick coatings do not last forever. This means that this machine (and all of the other machines on this page) will eventually need to be replaced. If you want to make overstuffed quesadillas or 8 inches just isn’t enough, this George Foreman quesadilla maker is the choice for you. It’s easy to use and clean. As long as you remember to set a timer, you’ll get a perfect quesadilla every time. The Black & Decker QM-1088 Quesadilla Maker is a great alternative to the George Foreman or Hamilton Beach models above. It’s quite similar in both functionality and size, meaning it’s an excellent choice if you prefer the Black and Decker brand or if this unit is discounted deeply on an online sale. How similar? The QM-1088 is nearly identical to the Hamilton Beach 25409. It’s got the same grooved cooking surfaces that pinch out 6 even wedges. Just like the Hamilton Beach, it’s got a latch, a ready light, and a power cord, and it lacks an on / off switch. 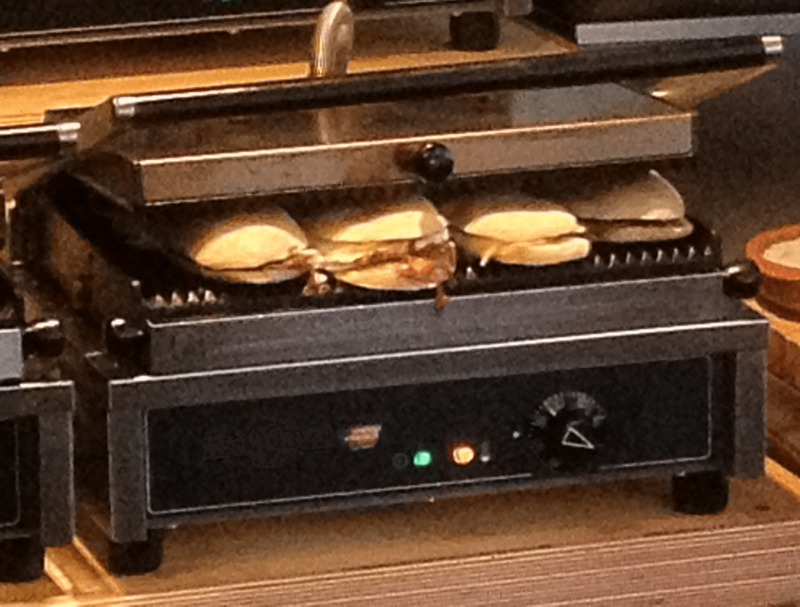 Performance wise, it’s very similar, with both units delivering gooey quesadillas after about 3 minutes of cook time. Both are incredibly easy to wipe down with a damp cloth afterward. So why isn’t this our top pick? At the time of writing this, the QM-1088 is a bit more expensive than the other choices. There’s a pretty good chance that this will change by the time you read this, however, so be sure to check the prices on all of the options on our list. If the QM-1088 is on sale or you simply prefer the Black and Decker Brand, it’s a wonderful choice for your kitchen. You’ll be making perfect quesadillas in no time. 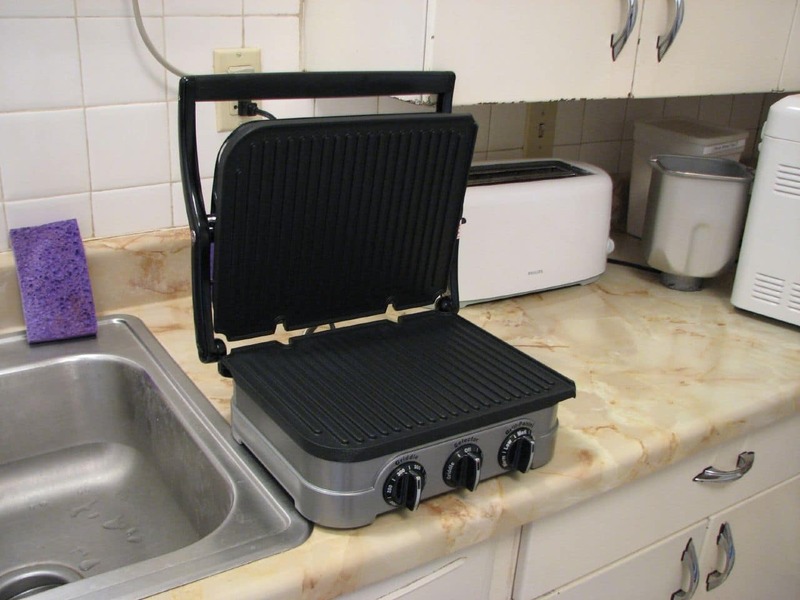 Okay, So What About A Quesadilla Press? There’s no such thing as a quesadilla press. Before you get up and arms and tell me I’m wrong, hear me out. 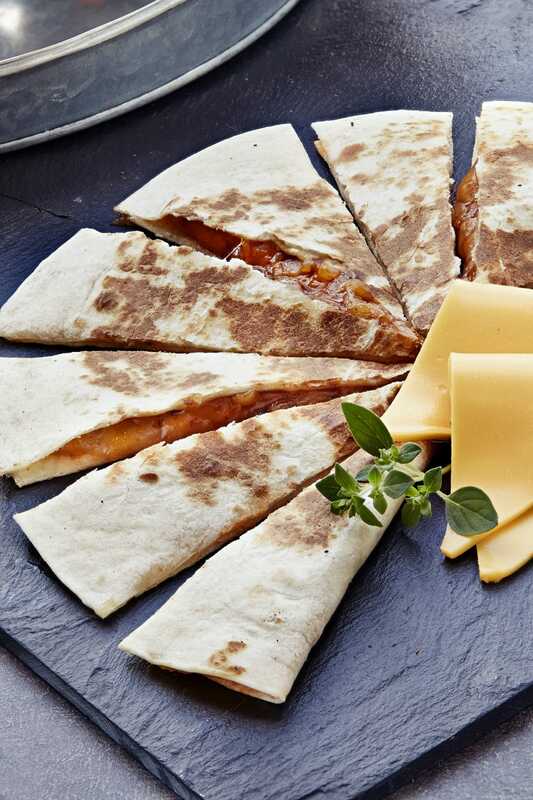 A quesadilla is made of two tortillas with cheese and fillings in between. There’s no need to “press” anything. The machines above will squeeze the tortillas together a little bit as they cook, but that’s simply for heating purposes. Any pressure is applied in order to put the top heating surface in contact with the top tortilla. More pressure than this simply makes filling fly out the sides, which is not a good thing. 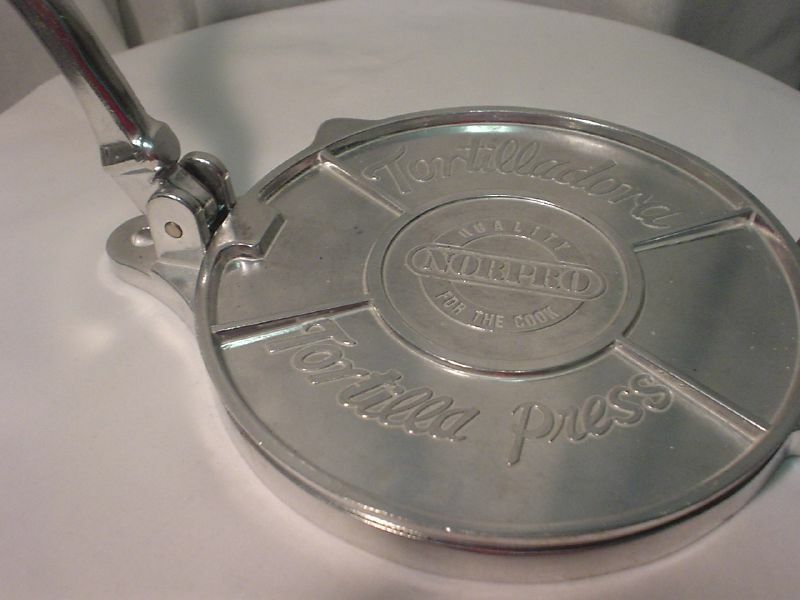 There is, however, such a thing as a tortilla press. Tortilla presses are incredibly useful kitchen gadgets, but they’re not even remotely similar to quesadilla makers. Tortilla presses are used for making your own tortillas at home. They’re simply two flat pieces of metal connected by a hinge. You place a ball of dough in between the plates and fold them shut. This squeezes out the ball of dough into a round, flat, tortilla-like shape. While tortilla presses have quite a few uses, they’re not necessary for the creation of quesadillas. As long as you buy your tortillas from the store, you don’t need a tortilla press at all. 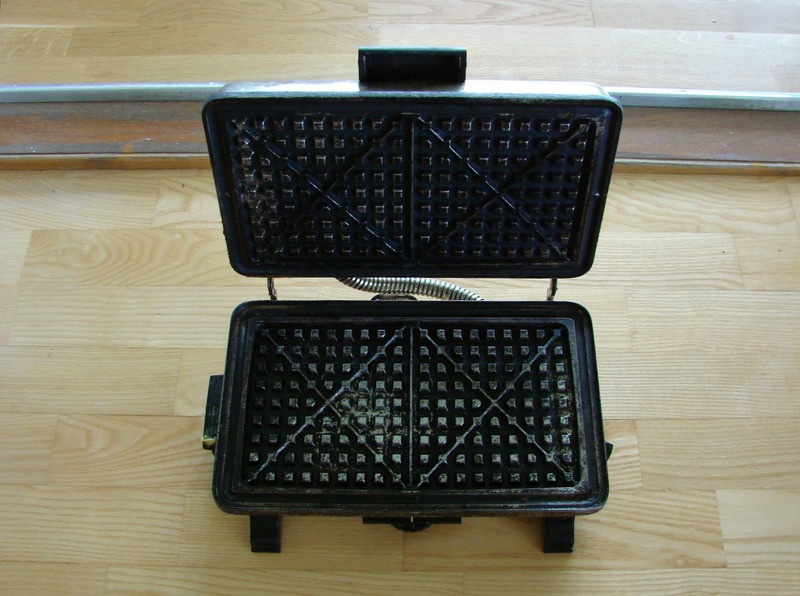 Even if you had one, it wouldn’t be useful for making quesadillas. It doesn’t apply any heat at all, so using one would be about the same as simply placing a cutting board (or book) on top of your raw quesadilla and putting all of your weight on it. You wouldn’t accomplish much. 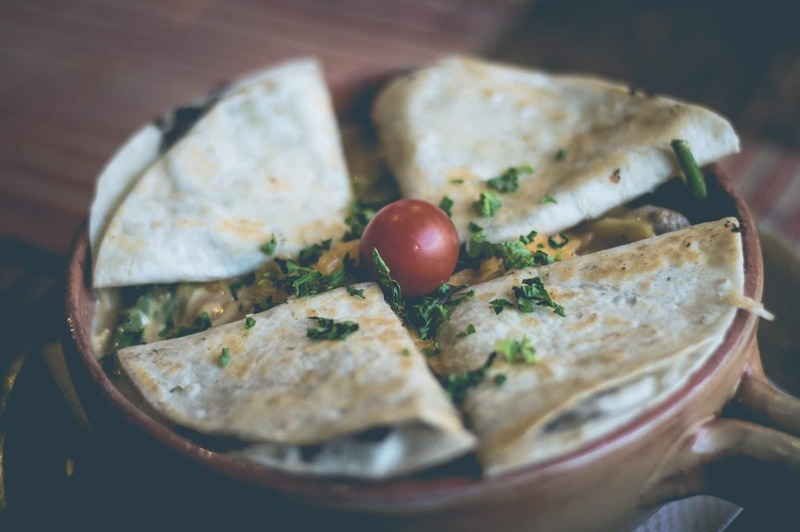 Are Casa Dias different from Quesadillas? “Quesadilla” is a Spanish word that translates roughly to “little cheesy thing.” It’s a bit hard to spell for non-Spanish speakers, however. If you got a text asking for a “casa dia” maker, your friend or family member probably meant “quesadilla” instead. Simply refer to the reviews above to figure out which product to buy! Do Quesadilla Makers Make Real Quesadillas? Traditional Mexican quesadillas are somewhat different from the quesadillas you probably make at home, with or without a quesadilla maker. When making a traditional quesadilla, you don’t actually use finished tortillas. Instead, you partially cook the tortilla just enough to be able to fold it, then fold it in half around traditional Mexican cheese. While pre-cooked tortillas are sometimes used, they’re mostly used to make a variant called “quesadillas fritas” that are fried in oil. This doesn’t mean that there’s anything wrong with quesadilla maker quesadillas. When most people in the US think of “quesadillas,” they think of the exact food item that your quesadilla maker makes. In other words, the quesadillas you make at home are real, even if they aren’t in keeping with the traditional origins of the dish. What Should I Put In ? There’s no rules or regulations governing your choice of quesadilla fillings. In general, if you think it will go well with cheese and tortillas, try it! Chopped peppers, vegetables (like avocado, spinach, tomato, and onion), and meat work great. You don’t have to make a “Mexican” themed dish here. Try blending flavors from other cultures, too. An “Italian” themed quesadilla might use mozzarella cheese, salami, tomatoes, and a drizzle of olive oil. Use your creativity to come up with a list of fillings that works for you. At the end of the day, the biggest difference between modern quesadilla makers is the size of the heating plates. Before buying one, head to the store and see what size the tortillas available to you are. If they’re 6″ or 8″, we recommend choosing the Hamilton Beach tortilla maker. If they’re 10″, the George Foreman is a clear winner. Finally, if they’re 12″, the Betty Crocker Pizza Cooker is the best choice. It’s also a solid choice for anyone who wants to “bake” foods outside of the oven in a convenient 12″ non-stick dish.